Toshiba’s Digital Products Division announced its Satellite E series ultrathin notebooks today: The 14-inch Satellite E45T and the 15.6-inch Satellite E55t/E55Dt will feature touchscreens and will be available with either fourth-generation Intel Core processors (Haswell) or AMD A6-series (Kabini) CPUs. 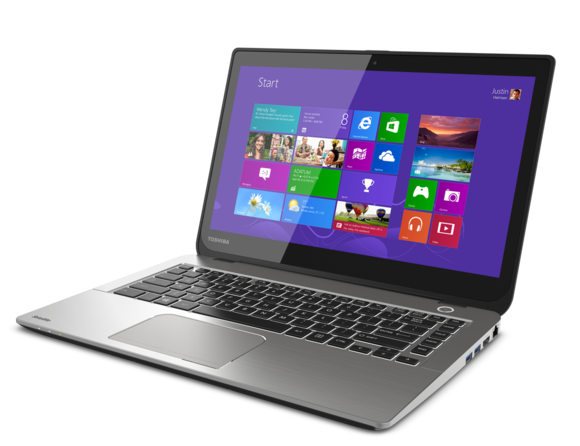 Toshiba’s new Satellite E45T notebook will feature a 14-inch touchscreen. The notebooks in Toshiba’s new Satellite E series will be equipped with backlit keyboards. The 15.6-inch E55-series notebooks will have a numeric 10-key pad. Bae said while the Satellite E series notebooks will range in price from just under $600 to less than $900, they will feature brushed-aluminum casings, backlit keyboards, two USB 3.0 ports (one with USB Sleep & Charge, for charging USB devices while the computer is asleep), one USB 2.0 port, HDMI out, a full-size gigabit ethernet port, an SD card slot, and either 500- or 750GB mechanical hard drives that can be combined with an optional 32GB SSD cache. The 15.6-inch model will have an embedded numeric keypad. The new line will also have dual-band 802.11ac wireless network adapters, and models with Intel CPUs will support Intel’s WiDi wireless display technology. The Satellite E series will boast brushed-aluminum enclosures. Most Satellite E-series notebooks will rely on integrated graphics, but customers will have the option of configuring them with a discrete graphics processor in the form of Nvidia’s GeForce 740M. Either way, the display will be limited to a native resolution of 1366 by 768 pixels. 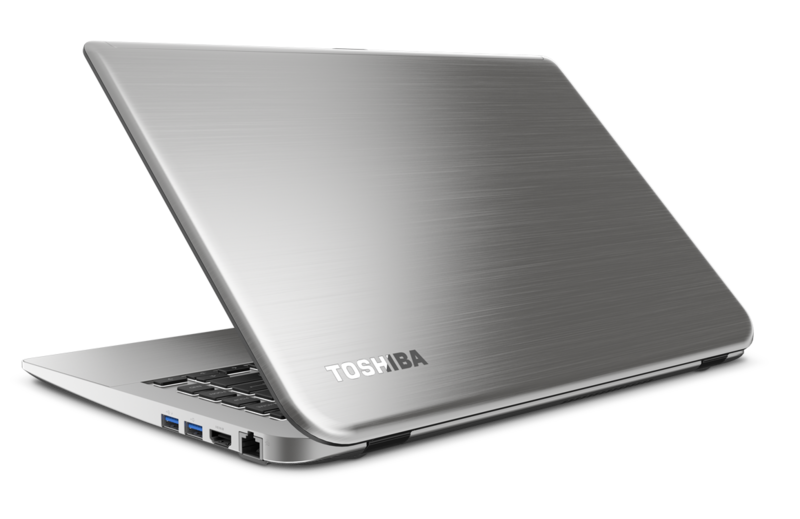 The 14-inch Satellite E45T will be available August 4 at Best Buy stores, BestBuy.com, and Toshiba Direct. 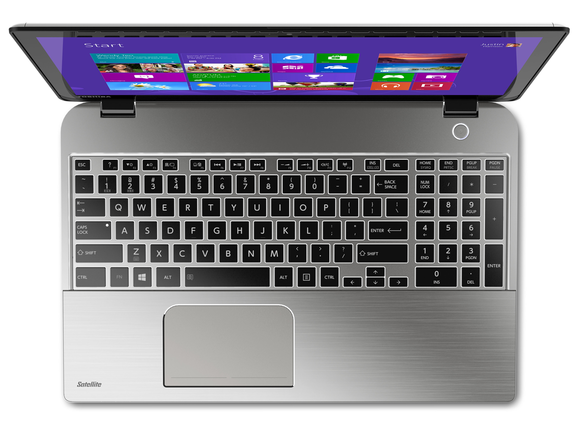 The 15.6-inch Satellite E series will be available in September online and at major retailers. 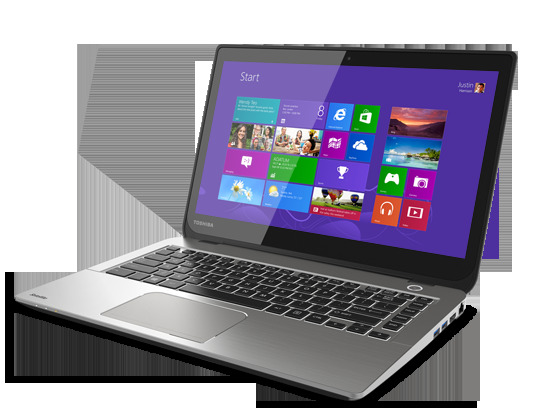 Toshiba has not announced detailed pricing for either model.